From football and baseball, to track and field and swim meets, angle frame bleachers are the most cost effective seating for all spectator sports. Because of their lower cost and ability to be quickly constructed, angle frame bleachers are the top choice for many high school sports organizations. The permanent angle frame bleachers offer maximum strength and low maintenance cost for the budget-minded owner and also provides the freedom of expansion as your seating needs grow. The elevated and non-elevated angle bleacher versions are two different options that can be combined with a variety of decking, seating, and railing possibilities in either hot dipped galvanized steel or aluminum understructure. Galvanized steel is the most durable understructure available while the aluminum understructure offers a light weight, low maintenance alternative. The understructure, seats, seat backs, and risers can be powder coated in several finish colors to give your facility a more customized look. Angle frame bleachers are designed to be portable, but can be made permanent by anchoring them to a concrete slab or strip footing. In addition to all of the varying design potential of the angle frame bleacher, it is also an affordable, cost effective way to meet the seating needs of your organization. 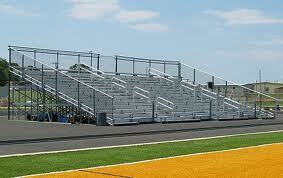 Contact Toadvine Enterprises and find out if angle frame bleachers would be a good fit for your school or organization. Contact us for a free consultation and a quote on seating for your facility. We have bleachers covered from every angle.